American Horror Story: Cult is edging closer and closer to our screens but we're still not really any closer to finding out who Evan Peters will actually be playing (or if he'll be playing someone who it's acceptable to have a crush on.) But a brand new teaser has just dropped and everyone is freaking out about it because the creepy cult member featured in it LOOKS *clap* LIKE *clap* EVAN! How? What? Why? When and Where? Well, we know Evan has blue hair and we've now all assumed that his character will be part of the cult in some way because there's also a girl in one of the trailers with blue hair (Halsey?) like Evan's so that seems like hair colour is gonna be a ~thing~. We'll take that as hard cold evidence, tbh. 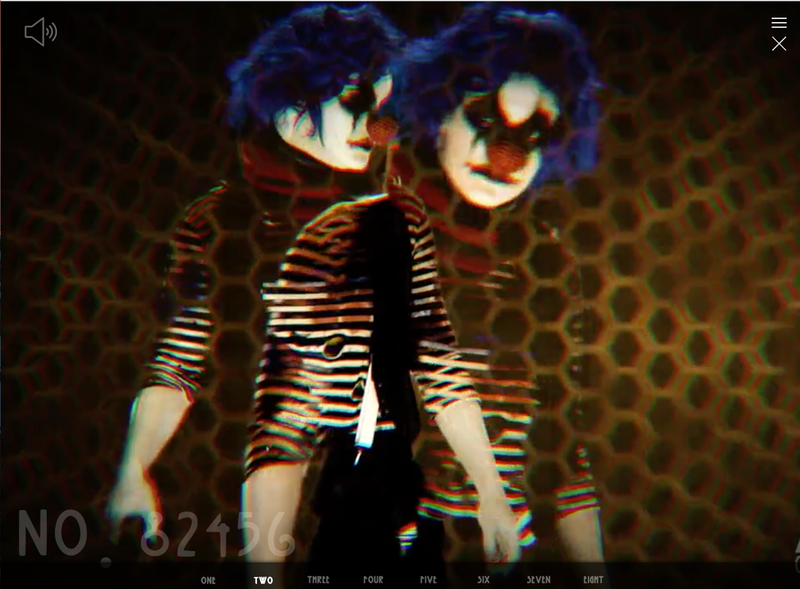 And now, thanks to the now iconic hair colour, fans who have already signed up to take part in the show's creepy real life online cult think they've caught the first glimpse of his clown character in one of the teaser trailers on AHSCult.com. Once you unlock the second week of the cult initiation process, a blue haired clown appears as one of the members and fans IMMEDIATELY thought it was Evan's character, Kai. Could it be? Evan? Sweetie? Is that you? Here's a closer look at the blue-haired character. Fans on Reddit have also spotted a clown who looks A LOT like new cast member Billie Lourd too. But before you get TOO excited about the first glimpse of our new favourite character... it's worth noting that no actors from the show have ever been present in these kind of promos or teaser trailers for AHS but that doesn't necessarily mean that their characters aren't being represented in some way. Then again, the nature of the season could mean that it IS them after all. Only time will tell kids, see on September 5th.